Thanks for posting the large photos. This NAC image shows a bright crater with an extensive system of impact ejecta rays; the crater is also clearly visible on the southern portion of Mercury near the limb of the planet in the departure full-planet image (PIA11245). This impact crater and its associated system of rays were originally detected in 1969 as a “bright feature” in radar images at 12.5-centimeter wavelength obtained by the Goldstone Observatory in California. Subsequently, about a decade ago, radar images acquired by the Arecibo Observatory in Puerto Rico clearly revealed this feature to be a crater with a fresh system of rays of rough material radiating outward from it. This feature has been referred to simply as feature “A.” MESSENGER’s recent Mercury flyby provided the first spacecraft images of feature “A,” enabling this relatively young crater with its impressive set of rays to be seen here in close-up detail. with a major meteor, it will not render us extinct. It took a while for us to evolve. are all bleak desserts, subject to both extremes of temperature. After the novelty wears off, thay will offer rich supplies of boredom. "...a crater with a fresh system of rays of rough material radiating outward from it." Which would be what? Radiation? Yeah, the rough material was radiated out. The materials were radiated out as in displaced then, causing the crater? I was reading it as a reference to the light (white) spots radiating as if there was a form of energy, and then asking what form that energy would be in. The materials were radiated out as in displaced then, causing the crater? as if there was a form of energy, and then asking what form that energy would be in. No, just the kinetic energy from the impact. NEW YORK — Think the moon has many craters? New photos from the first spacecraft to orbit Mercury show that the tiny inner planet has far more impressive battle scars from regular high-speed peltings by space rocks. NASA's Messenger spacecraft, which began orbiting the planet less than two weeks ago, reveals a pock-marked planet full of craters from pieces of asteroids and comets. There's a small spacecraft called Messenger that's been orbiting the planet Mercury for a year. Today, at the Lunar and Planetary Science Conference in Houston, astronomers revealed what they've learned about the innermost planet in our solar system, and some of the new knowledge is puzzling. Maria Zuber, a planetary scientist at the Massachusetts Institute of Technology, studied a large crater 900 miles across called Caloris. "The northern half of Caloris has actually been uplifted so that it's actually higher than its rim," she says. "And of course craters are holes in the ground, but this hole in the ground has been uplifted so high that the base of the crater is above its rim." Another surprise is how big Mercury's core is. It took the Messenger spacecraft nearly eight years to reach orbit around Mercury. Follow the topsy-turvy path the probe took to reach the planet closet to the sun. Zuber says to get an idea, if Mercury were an orange, the core would be the size of the fruit, while the outer crust and mantle would only be as thick as the orange peel. For comparison, if the Earth were an orange, the peel and fruit would be about the same width. Astronomers like Zuber have been waiting for a long time for Messenger's data. The spacecraft launched nearly eight years ago, on Aug. 3, 2004. Now you may be thinking, "Wait a minute. Mercury isn't all that far from the Earth. That's spitting distance in astronomical terms. Heck, it's less than 50 million miles at its closest approach. Why does it take so long to get there?" Zuber says the answer is gravity. Mercury's orbit is closer to the sun than the Earth's, and if you launch a rocket toward the sun, the sun's gravity is going to cause your spacecraft to speed up. "And in order to get into orbit around the planet, the spacecraft has to slow down enough for the planet's gravity field to capture it," she says. If you have a giant rocket engine, you can use that like a retrorocket to counteract the sun's pull, just like Scotty does when the Starship Enterprise is about to fall into a black hole. But Messenger didn't have a giant engine. A never-before-imaged area of Mercury's surface is seen from an altitude of 280 miles above the planet during the Messenger's first orbit with the camera in operation. 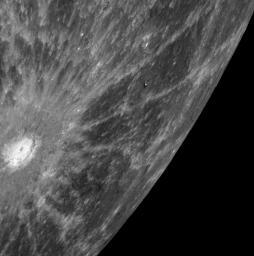 The area is covered in secondary craters made by an impact outside of the field of view. Some of the secondary craters are oriented in chain-like formations. This dramatic view was captured as the spacecraft's highly elliptical orbit positioned MESSENGER high above Mercury's southern hemisphere. New observations from a spacecraft reveal the planet did not form the way scientists thought. The surface of Mercury is seen in a picture taken by NASA's Messenger spacecraft as it approached the planet during a fly-by on January 14, 2008. The image was taken about 11,000 miles from the planet and shows a region 300 miles across. A new, man-made visitor has arrived in orbit around the planet Mercury. So instead, it used the gravity of other planets to slow it down with respect to the sun. In a trajectory worthy of Rube Goldberg, Messenger looped once around the Earth, then made two close encounters with Venus. When it arrived at Mercury in 2008, it was still going too fast, so it flew by Mercury three times, slowing down a little more each time. "The fourth time it came by Mercury it was slowed down enough that when we fired the main engine, Mercury's gravity field was able to capture it," says Zuber. Messenger has been orbiting Mercury since March 2011. Sean Solomon of the Carnegie Institution for Science is another one of Messenger's principal scientists. He says the spacecraft's original mission was supposed to end after one year, but things were going so well they persuaded NASA to extend the mission. "Just on Sunday we began the Messenger extended mission," he says. The extended mission is scheduled to last another year, so astronomers expect they'll have more to say at next year's meeting. The reports presented at today's conference will also appear in this week's edition of the journal Science. What with all of the impact craters, Mercury sure looks a lot like the moon. Explanation: What are those unusual features on planet Mercury? The slightly bluish tinge of features dubbed hollows has been exaggerated on the above image by the robotic MESSENGER spacecraft currently orbiting Mercury. The rounded depressions appear different than impact craters and nothing like them has been noted on Earth's Moon or anywhere else in the Solar System. The above image is a section of the floor of Raditladi impact basin about 40 kilometers wide that includes the mountains of the central peak. One progenitor hypothesis is that the hollows formed from the sublimation of material exposed and heated during the violent impact that created the Raditladi basin. NASA's MESSENGER is the first spacecraft ever to orbit Mercury, and is currently scheduled to explore the Solar System's innermost planet into 2013.